The Arab NGO Network on Development (ANND) launched the third issue of the Arab Watch on Economic and Social Rights, with a focus on the question of Informal Labor. The latest Arab Watch release addresses the question of informal labor from a rights-based perspective, which creates another challenge in monitoring these generally missing rights, in addition to the struggle to achieve them and the main role of the state in providing them. It contains two main sections. Section one covers the global and regional context, through the analysis of national reports and international data and statistics. 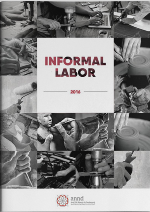 It also contains studies on the relationship of informal labor with neoliberal policies, migration, and the gender aspect. Section two contains national reports from Algeria, Bahrain, Egypt, Iraq, Jordan, Lebanon, Mauritania, Morocco, Palestine, Sudan, Syria, and Yemen. The report shows that civil and economic rights are at the core of the question of informal labor, especially rights related to health insurance, pensions, and decent living, in addition to the right to housing, clean drinking water, sanitation, social services, and infrastructure. It also impacts the right to education and training in line with economic and technical developments. All such rights are enshrined in the International Covenant on Economic, Social, and Economic Rights, which goes hand in hand with the Universal Declaration of Human Rights, in addition to the Constitutions of most Arab countries. However, a shrinking number of workers are enjoying such rights. The report was launched in two workshops held in each of Beirut and Cairo, which brought together a group of experts, researchers, academics, and civil society activists. On Monday, 8 May 2017, ANND, in cooperation with the Issam Fares Institute for Public Policy and International Affairs, held a workshop to launch the “Arab Watch on Economic and Social Rights 2016: Informal Labor” at the Institute’s premises at the American University of Beirut. The next day, the report was launched in Cairo, in collaboration with the American University of Cairo (AUC), the Economic Research Forum (ERF), and the Egyptian Association for Community Participation Enhancement, at the ERF premises in Cairo. In addition to launching the report, the two workshops aimed to initiate a serious and comprehensive debate on informal employment in the Arab region.